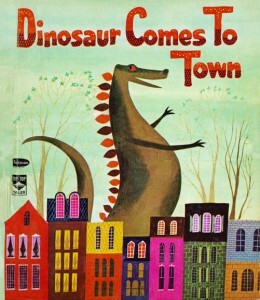 Dinosaur Comes To Town was one of the books that inspired me to be an artist as a kid. My sister claimed ownership of this book in our household, but me being the dinosaur geek that I am, I swiped it every chance I could. The artist, Art Seiden, was notably a children’s book illustrator, but also set the tone for advertising in the 1950s and 60s. I love the texture he creates with gouache and what looks like water colors. His characters are simple looking shapes that are anything but – they’re easily recognized and iconic. Plus there’s that nostalgic thing going on. His work reminds me of a time when I didn’t have to worry about anything except if I were going to miss Sesame Street. You can find the entire book posted at Golden Gems, a blog that describes itself as “a collection of little golden books and other vintage & modern illustrations meant to inspire and delight.” It certainly does. You can also find some more of Seiden’s illustrations at Today’s Inspiration by Leif Peng and more at his Flickr page too. Thank you for posting this. I was wracking my brain trying to remember the name of the book and found it through Google images. It was one of my favorite books when I was 5. Although a bit scary also to imagine a dinosaur walking to town!